Growing replacement organs in a lab and transplanting them is science-fiction dream-turned-very-possible-reality, but so far it's been limited to simple tissues. Today, MIT published findings on successful attempts to build functional heart tissue, using a modified machine originally meant to build integrated circuits. 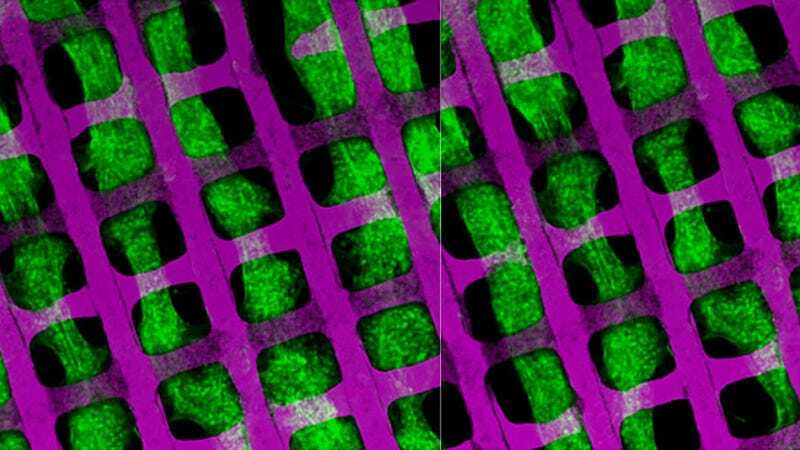 Growing heart tissue in the lab presents an enormous challenge. If the muscle cells aren't precisely arranged to pull along the same axis, the tissue can't do its pumping job. For the 3D cell guidance they needed, researchers at MIT and the not-for-profit Draper Lab created thin, micro-perforated sheets of biorubber. They stacked these sheets with a programmable machine from the integrated circuit industry, positioning the pores to create interwoven muscle bundles when seeded with mouse muscle cells and rat neonatal heart cells. By controlling the alignment of the resulting fibers, the researchers can produce tissue that precisely mimics the natural heart.